For a society that put men on the moon and connected the entire world with a little invention called the Internet, our progress has only gone so far; we still cling tightly to our traditions. Superstition in all its guises represents one of those traditions. If you’re saying, “Not me!” you may want to examine that denial a bit closer. How many times have you crossed your fingers hoping to bring yourself good luck? Finger crossing is a sign of the Christian faith (symbolizing the crucifix), meant to bring good fortune. Or how about that worry stone in your pocket or purse? Is it there to relieve stress or is it there as a talisman against evil? And if it’s not a stone, is it a lucky coin or a fortune from a Chinese cookie with some special significance? Is it something more visible, such as an article of clothing? Michael Jordan wore his North Carolina shorts unabashedly beneath his uniform because he was convinced they would bring him good luck on the court. Maybe, like The Babe, you scoff at such practices you feel are baseless; maybe you demonstrate your own, more covert form of superstition. After all, if you wash your car during a drought, hoping for rain, your neighbors will simply think you’re keeping the vehicle neat! Does this paint you as a “closet practitioner”? If you’re afraid of being out’d, perhaps you should try the more customary forms of superstition, such a searching for that lucky and illusive four-leaf clover, picking up that dirty penny from the street (heads only!) so that “all day long, you’ll have good luck”, or carrying the foot of some unlucky rabbit around with you. Because of their propensity to breed profusely, rabbits became a symbol for fertility and prosperity: things that our ancestors prized as good fortune. Here in the West, the practice of knocking on wood is supposed to draw good luck to the person doing the knocking. This custom may have derived from a time when people thought that spirits lived in trees, and that the knocking would scare them away. And then there is the curious and contradictory case of black cats. Some consider a black cat lucky and some, a harbinger of ill fortune. Those who shun black cats are continuing an ages-old fallacy that believed cats to be the familiars of black (evil) witches. Some folks still avoid black cats crossing their paths as if the animals were toxic landfills. Cats were also thought to “steal the breath” from babies and so, were banned from many nurseries, which was, ironically, a dangerous practice. Cats are attracted to infants because of the smell of milk on their breath; that is the extent of their so-called wicked ways. A cat’s senses are far more acute than those of mere mortals, and a cat will always be the first creature in the house to sense when something is amiss. Stories abound of savior cats that have howled at their humans and led them into nurseries where babies were choking or otherwise in harm’s way. Unlike the uniformed, ancient Egyptians knew cats of all colors to bring good luck; they rid the graneries of the rats and mice that ate the crops and carried disease. Cats were revered in Egypt, elevated to the status of gods (Bastet). In fact, to kill a kitty, even accidentally, was an act punishable by death. While cats are highly intelligent, sensitive, and affectionate creatures, some cruel, heartless humans spell bad luck for black cats, particularly at Halloween. No reputable pet shop or breeder will sell a black cat during this time of year, for some of the cat-haters use the felines in sadistic rituals. In fact, there is a legend that says that no black cat living today is 100% black, because they were all killed during the witch-hunts in Salem, Massachusetts and abroad. Siding with the Egyptians, sailors kept black cats on board when they were at sea, because the kitties were thought to earn the sailors a safe journey home. Certainly, the cats controlled the rats that plagued many a ship. Those who took to the high seas also observed the sky to portend weather conditions, which is the origin of the adage, “Red sky at night, sailors delight; red sky at morning, sailors take warning.” A red sky predicts the possibility of bad weather. For landlubbers, there are many customs thought to bring good luck into the home, one of which is to display sculptures of elephants. Another is to put parsley into a vase of cold water and change the water daily. I guess this is good luck if you cook often and don’t want to keep going back to the store for fresh parsley. Some think that placing a pyramid under one’s bed creates positive energy. Others think that a knife under the bed during childbirth relieves pain. The entire philosophy of Feng Shui, a time-honored practice of creating good fortune and prosperity, is based upon the type of elements in the home (wood, metal, fire, and water) and the placement of those elements. For instance, it’s thought to be bad luck if you don’t use all of the burners on your stove, and good luck if you have some type of running water in the house, such as a small, bubbling fountain. However, if your master bathroom faces the front of the house, the running water (good luck) is said to flow right out the door, leaving the homeowner strapped for cash! Certain foodstuffs are associated with good luck and/or the warding off of evil. Garlic was even given to Egyptian slaves because it was thought to fight illness. In fact, cloves of garlic were even found in King Tut’s tomb. In light of garlic’s antioxidant properties, the designers of the Great Pyramid were right on the money with respect to its healing abilities. A braid of garlic hung at the entrances to one’s home, or hung around one’s neck, allegedly keeps vampires at bay. Certainly, this much garlic will keep just about anyone away! In a more positive vein, an apple a day will keep the doctor away, and there is some truth to this. Apples contain a compound that is particularly helpful to those who suffer from asthma and related conditions. It is recommended that the entire apple is eaten, skin and all. I remember standing in line at the supermarket one evening when the cashier told the customer ahead of me, “That will be six dollars and sixty-six cents.” The woman freaked out. She begged him to charge her at least a penny more, as she hated the number 666. The manager was eventually called in to rectify the problem, because the woman was growing increasingly hysterical and holding up the line! In Britain, when prisoners were hanged, they were forced to walk 13 steps to the noose. Some of us still get a little jittery when Friday the 13th rolls around. In deference to this fear, many hotels, office buildings, and apartment complexes do not have, or at least, do not give power to, a 13th floor. The numbers of the floors will either jump from 12 to 14 or the 13th floor will be called 12B. In some cultures, 13 is considered lucky, perhaps in a thumb beneath the nose to bad luck. 13 is the number that Italians play when gambling. In the Jewish tradition, 13 is a special number for boys because the age of 13 is marked by the bar mitzvah (rites of passage into manhood). Certain sports figures, such as Shaquille O’Neal and Wilt Chamberlain consider and even wore the number 13 on their official uniforms. A-Rod (Alex Rodriguez) adopted the number when he joined the Yankees. Considering his well-publicized antics involving womanizing, abusing steroids to enhance his athletic performance, and stealing the thunder from the Boston Red Sox by way of an announcement during a most critical game, perhaps that number has proven unlucky after all. Whether we decide to stay home hiding beneath the covers, or face our Friday the 13ths head-on depends on our individual beliefs. A soothsayer had warned Julius Caesar about the Ides of March. This day falls on the 15th day of the month, a day on which debts were historically settled. Although Caesar assumed the soothsayer to be a dreamer and refused to heed his warning, the emperor’s fellows banded together to plot and carry out his assassination. Greeks consider Tuesday a very unlucky day, for it was the day of week on which their ancient city of Constantinople fell (May 29, 1453). The Greeks do not like to open their business on this day, and assume that any new business initiated on a Tuesday is sure to result in failure. And let’s not forget the superstition surrounding “the evil eye” cast by a jealous or nasty person. It is said to wreck all manner of havoc upon the suspecting, from cows that give curdled milk to causing the one’s hair to fall out suddenly in clumps. Evil eye amulets are produced to ward off the malevolence; in Greece, such talismans are readily available in the shops in Athens. They are used to protect new cars, new babies, and new sweethearts. While we’re on the topic of the evil eye, I fell compelled to correct an erroneous notion concerning the Italian’s use of e corna (“the horns”). Not to be confused with the Vulcan peace sign, the e corna is made by holding up one’s hand and bending the two middle fingers toward the palm. This sign is not meant to be a curse; it is meant as the opposite: a means of warding off evil or negative people, such as one’s in-laws. Other small gestures or acts can be anything but insignificant. For instance, as children, my siblings and I were afraid to step on cracks in the sidewalk for fear of breaking our mother’s back. And I still hate to see someone open up an umbrella indoors because, as a child, I was told this would bring bad luck. Some of us instinctively throw a pinch of salt over our left shoulder when we spill salt. Spilled salt is thought to conjure up Satan and when salt is thrown, it goes right into his eyes. Have you ever wondered why people say, “God bless you” (“Gesundheit” in German) after a sneeze? While some people think this was a way to prevent the soul from escaping, others link it to responding to a symptom of the Black Plague, a rampant killer during the Middle Ages. Putting shoes on the table or the bed, or placing a hat on the bed, is certain to bring bad luck. Many Native Americans did not wish to have an owl in their space, as this bird of prey was deemed to be a harbinger of death. Italians believe that having birds in the house are unlucky; a bird that flies in through the window indicates an impending death. They also do not believe in killing sparrows. As a child growing up in a small American town, I learned the little song, “Ladybug, ladybug, fly away home” as children are often tempted to squash bugs of all types. Particular respect for ladybugs arose because these pretty and helpful little insects are thought to represent the Virgin Mary. 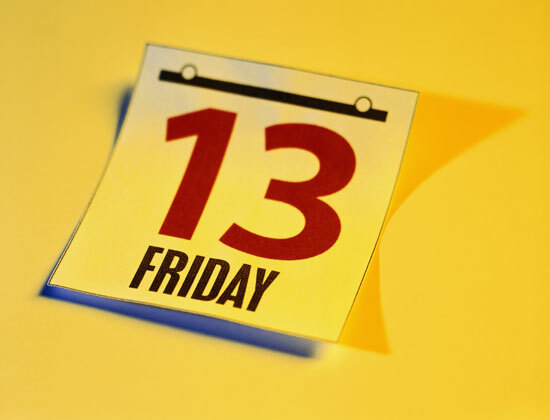 Our list of superstitions is nearly as long as human history. Lighting three cigarettes with the same match is a no-no, and breaking a mirror will cause seven years of bad luck. To break this spell, the mirror’s pieces are to be buried in the moonlight. If your ears itch, someone is talking about you; if your palm itches, get ready to come into some money or pay out some cash, depending upon which hand needs scratching (right = money in, left = money out). Should your nose itch, prepare to enter a fight. However, if your feet itch, this means that travel is in the offing. Getting up on the wrong side of the bed foretells of a bad day, so be sure to put your right foot on the floor first and rise from the bed on the same side in which you entered it the night before. Walking under a ladder may incite an ambush from the Devil. Your old broom is not to be moved to your new home, for fear of carrying bad luck. Another hypothesis is that bad luck comes in threes. This particular superstition is eerie because, in my personal experience, it’s usually come true concerning deaths. And, a dog barking unexpectedly in a home with a sick person means that death is sure to follow. New Year’s Day signifies a clean slate: an ideal time to generate positive energy. Green vegetables such as cabbage, collards, kale, and chard are cooked and eaten on this day to illustrate the concept of money to come. Black-eyed peas and lentils are also consumed because they swell when cooked and appear round, like coins. Twelve grapes are also eaten, one for each month. Pork is also enjoyed, because pigs root forward (“Look ahead”) and not backward, like chickens. As chickens scratch for their food, they should not be eaten on New Year’s Day if we do not want to scratch out a meager living during the new year. What you find yourself doing on New Year’s Day determines what follows the rest of the year. If you stay in bed all day, your year will not be productive. I have always heard that if your home is dirty on this day, it will stay dirty all year. Conversely, if your house is clean, this forecasts accomplishments and getting things done in the year ahead. Parties signify good times ahead with love and friends in the coming year. 01. Kissing at midnight; avoiding weeping. 03. The first person to enter the house should be a male, because that is considered good luck (not to mention, sexist). 04. Nothing should leave the house without first bringing something in. 05. Wear new clothes. Red is a good choice, because it’s a happy color. 06. Pregnant women approaching their due dates hope to have babies born on New Year’s Day, as these children are thought to be lucky for the rest of their lives. 07. Fireworks should be featured as part of the celebration, as lots of noise keeps evil away. Church bells are also rung. Barring the fireworks and the church bells, one must run out into the streets to bang pots and pans, as they still do in parts of Brooklyn, New York. 08. Pay off all your debts before the first of the year, and do not lend money on this day because it signifies money leaving you for the rest of the year. 09. Keep a low profile. Don’t do laundry or dishes or wash your hair, so that your good luck is not washed away. 10. Make sure that your kitchen pantry and your wallet are well stocked, to facilitate a year free from poverty. 11. Drain your bottle of cheer down to the dregs to ring in a year full of good fortune. 12. Keep your doors open to allow the old year to escape unhindered. As stated previously, the world of sports is rife with superstitions. Rodeo competitors avoid bad luck by refusing to wear yellow and letting their horoscopes go unread. They will not carry change in their pockets, because this indicates that they will not receive a winning purse. However, it is good luck to eat a hotdog. Racecar drivers will not drive green cars. Boxers do not like to be first in the ring or wear new shoes for important matches. Baseball players believe there is only a certain amount of hits in a bat and when those are exhausted, the bat is no good. Many players refuse to have their pictures taken or sign autographs. Others determine to wear the same socks all season. The no photos phobia may harken back to the beliefs of certain African tribes, who were convinced that European explorers had captured their souls on film. Blaming superstition on not wanting to sign autographs may actually be a cover for players who wish to control (i.e., license) any and all merchandise that bears their names. As for the eternal socks, I’d hate to be an innocent teammate in the locker room!